Ooma offers VoIP services that are slightly different than the traditional VoIP providers, bundles of international minutes and a wide range of solutions, and one-ups most of its competitors. With a one-time hardware cost, Ooma has monthly service packages that include local and toll-free phone number, as well as extensions for fax and conferences. Ooma offers two different pricing plans, one for home users and one for businesses. Both of them involve the initial purchase of hardware equipment. Home users can benefit from the basic service free of charge once they purchase the Ooma Telo device. Call rates vary by location, but they are free of charge within US and Canada. If you are unsure of what your needs are, you can opt for a pay-as-you-go plan. However, those who need to call abroad on a regular basis should consider a bundled package. The business plan comes at a monthly rate of $19.95 per user. It includes a phone number for each user as well a virtual fax. 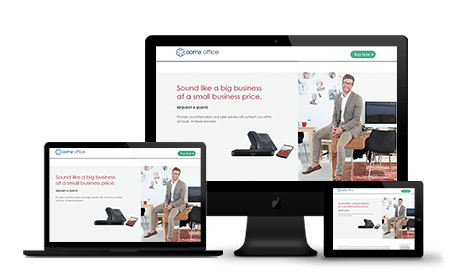 In order to use the VoIP service for your business, you will have to purchase the Ooma Office hardware package, which includes a Base Station and 2 Linx devices. Business users have only the pay-as-you-go option, with costs varying by location. Offering a system compatible with almost all land-line phones and hardware devices, Ooma has a lot of features that are not only great value for your money, but they will also make your life, and running your business, a lot easier. Porting allows users to keep numbers from previous VoIP services and move them to their VoIPLy account. This process takes a while to complete, around 2-4 weeks, but it allows businesses to keep their phone numbers and upgrade to better VoIP services. While regular Caller-ID services show you only the number calling when they are not in your contact list, Ooma makes use of the national database to find out who’s calling you, and display the name on your screen whenever possible. Not only can you use this feature to get a beep when you have a second call while engaged in a phone conversation, but all of your other phones will continue to be available no matter how long your call is. Just in case you need to take two calls at the same time, Ooma allows you to have two calls on the same number simultaneously. This feature comes in handy whenever you need to include a third party to one phone call. You can use this whenever you are on the go. Just set the numbers to be called in case you don’t answer on your main one. Together with call forwarding is another useful feature, backup number. It allows you to forward your calls to another phone whenever you don’t have an internet connection. Ooma offers you a solution for protecting yourself from any kind of intrusions. If you want only people in your contact list to be able to reach you, if you suspect a spammer, or you simply don’t want to take calls from people you don’t know, you can use this feature to set your privacy limits. Easy do-it-yourself installation is one of Ooma’s greatest advantages. Setting up the system only takes a few minutes. You need to create a My Ooma account, activate it using the seven-digit code printed on the hardware, and pick a phone number. Next, you need to connect the Base Station to Internet and power, connect the phone as well. Then you’re all set to start making calls. Ooma doesn’t leave you guessing when it comes to support services. Their online resources are comprehensive and include FAQs, troubleshooting guidance, manuals, video tutorials, and more. Customer service representatives are available by phone for business customers 24/7, and there’s even an email address for a customer advocate. Customer reviews suggest Ooma representatives are friendly and helpful, providing fast follow up. Support is available 24/7 via phone and chat. Phone support is available 24/7. Live chat support is available 24/7. Customer support can be emailed directly. A basic FAQ page is available. A community forum is available. A blog is available with various articles on Ooma's features, products, and news. All in all, Ooma offers a superior internet phone system and a great cost benefit ratio for anyone looking for a stand-alone service with a wealth of flexible features. The basic plan covers the needs of most casual users, but in case you want to turn this into your main phone line, you might consider the premium plan. It will still offer you a better value than a traditional land-line, not to mention the wide range of services and features. Ooma is a best buy. For $6.38/Month, it’s cost-effective, LOWER than my Bell monthly bill of $9 in the 1960s.